Darrell G. Mottley is a principal shareholder of Banner & Witcoff, and the past president of the D.C. Bar. Mr. Mottley provides strategic counseling in intellectual property protection related to patent and trademark matters, including procurement, opinions, licensing and litigation. Mr. Mottley’s intellectual property practice includes complex technologies in a variety of fields such as telecommunications, internet-related technology, computer-gaming, medical devices, semiconductors, mechanical technologies, and electro-mechanical technologies. Mr. Mottley advised a Fortune 500 company on an anti-counterfeiting project which included opinion analysis and scope and patent identification in a global anti-counterfeiting action using design/registrations. Mr. Mottley has advised clients on intellectual property matters in multi-million dollar venture capital transactions. He has successfully represented clients and obtained U.S. utility and design patents through the U.S. Patent and Trademark Office (USPTO), and the firm successfully enforced the patents to protect the core businesses of clients. He has successfully represented clients before the USPTO Patent Trial and Appeal Board (PTAB). Mr. Mottley has advised global companies on patent clearance and prosecution in cooperation with local country counsel in countries such as Singapore, Taiwan, Malaysia, Thailand, China, Hong Kong, Europe, Mexico, Russia, Brazil, Peru, and South Africa. Throughout his career Mr. Mottley has worked as an engineer, a project manager, engineering chief for the AAI Corporation, U.S. Army Belvoir Research and Engineering Development Center, and the National Oceanic and Atmospheric Administration. He has worked in diverse fields such as network communications, data center design and construction, advanced composite materials, military electronics, and military aircraft logistics and maintenance. Mr. Mottley earned a Bachelors of Science in Engineering Science and Mechanics in 1987 and his Masters of Business Administration from the Virginia Polytechnic Institute and State University in 1994 with a concentration in corporate finance and management science. He earned his Juris Doctor degree, with honors, in 2000 from The George Washington University, where he also served as an editor on the student editorial board of the ABA Public Contract Law Journal. He had an article published in the journal concerning information technology in the Federal Government. Mr. Mottley is the former Chair of the District of Columbia Bar’s Council on Sections. He also served as Vice-chair of, Division IV of ABA Section of Intellectual Property Law. Mr. Mottley is registered to practice before the United States Patent and Trademark Office and is a member of the National Bar Association concentrating on intellectual property law. He is also a Fellow of the American Bar Foundation, the premier U.S. socio-legal research institute. Mr. Mottley completed a four year term on the Industrial Advisory Council at the College of Engineering at Virginia Tech. In this capacity he assisted with the recruitment, retention, and development of students in engineering, focusing on under-represented students from diverse backgrounds. Mr. Mottley is an adjunct professor at The George Washington University Law School teaching classes in design law. Mr. Mottley previously lectured on patent law at Howard University Law School. 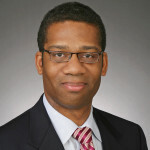 Mr. Mottley is a contributing author to the Thomson Reuters published book, Navigating Fashion Law: Leading Lawyers on Exploring the Trends, Cases, and Strategies of Fashion Law, in which he authored the section “The Tools for Protecting Fashion Law Clients.” He is also a contributing author to the ABA published book, Annual Review of Intellectual Property Law Developments, in which he authored the section “Design Patent Infringement – Egyptian Goddess.” He currently serves on the editorial board for the ABA’s Landslide magazine. Mr. Mottley practices in the Washington, DC office of Banner & Witcoff, Ltd.
05.09.2018 | Darrell G. Mottley moderates “Demystifying IoT Technology: Beyond the Buzzwords” panel at the ABA IoT National Institute in Washington, D.C.